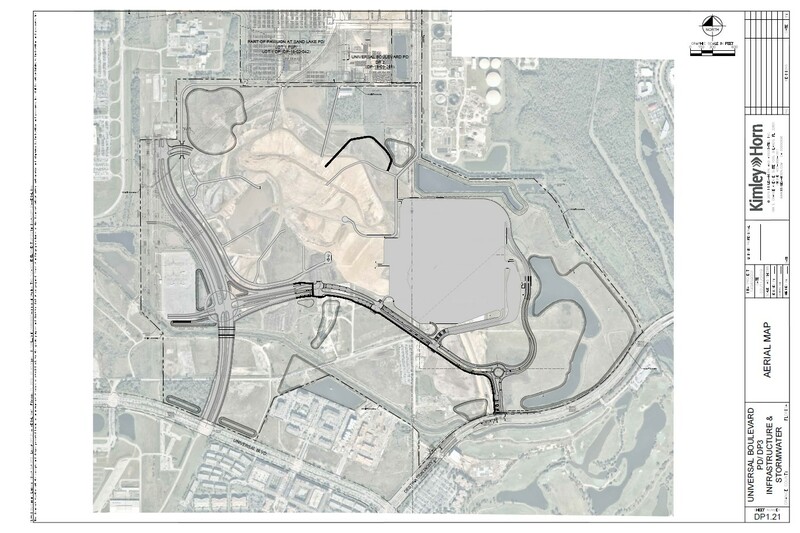 We got our first look at the development plans for Universal Orlando’s expansion land when they were released to the public back in October of last year. Just last month, a revised version of those plans were released. 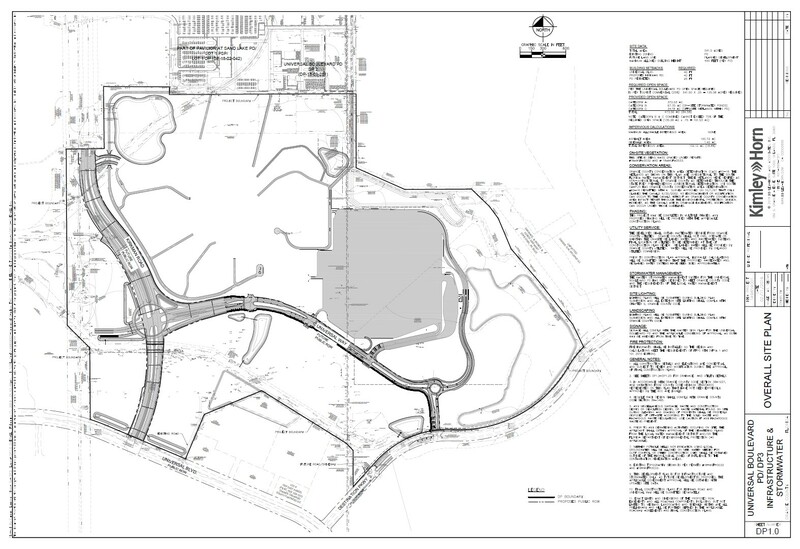 Let’s take a closer look at these updated plans, as well as recent land grading and water drainage permits, to see what we can learn about the new theme park Universal appears to be developing. 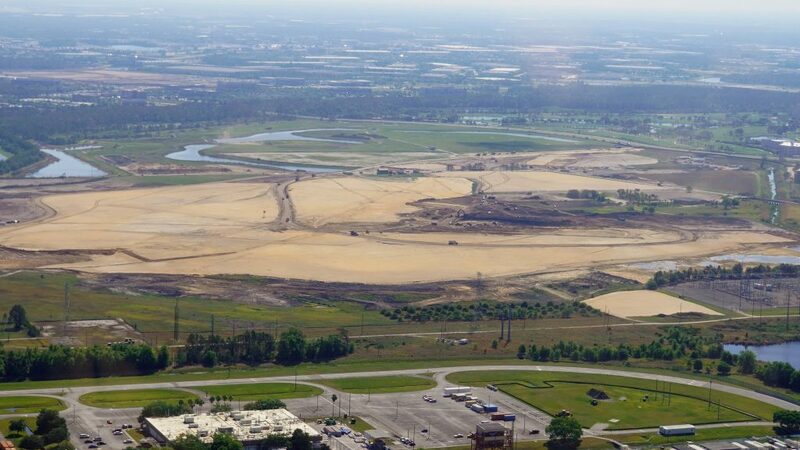 Located a couple miles south of the current Universal Orlando Resort, the new theme park will be built on a 541.5 acre plot of land near the Orange County Convention Center. Rumored to be named “Fantastic Worlds,” the new park is said to be one of the largest Universal has ever built. In addition to a new theme park, the new south resort is also expected to contain on-site hotels, and perhaps an entertainment complex. Comparing the newer version of the plans, which were made publicly available on February 12 of this year, to the older plans from October of last year, we can see that a lot more detail has been added. 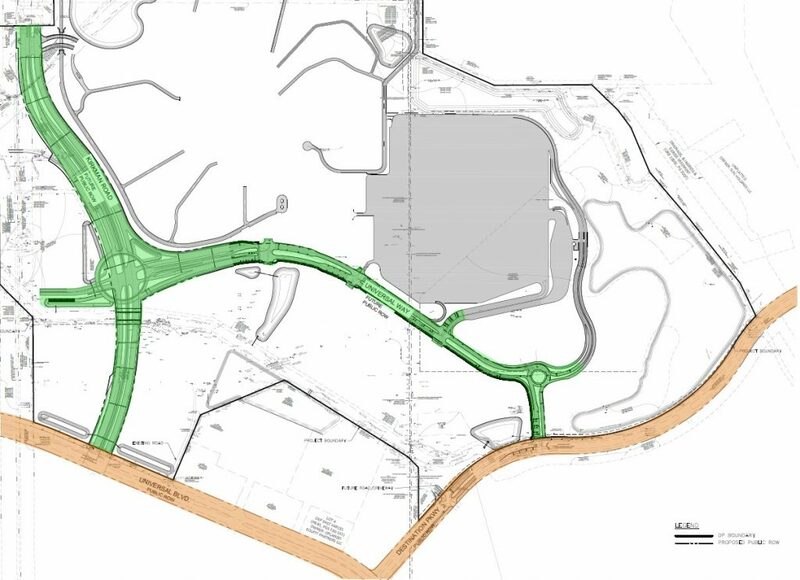 Access roads for emergency vehicles have been added to the plans, which may provide us with insight into the layout of the future theme park. Roadways are now labeled throughout the document. And the flat parking lot we originally saw in the old plans is now displayed with great detail in the updated version. The above image is a closer look at the proposed flat parking lot. I have added labels for what I believe the different elements are. Note: The labels and colors are my interpretation for how the parking lot will be laid out, but all drawn details are from the actual plans. The proposed lot reminds me a lot of the original parking lot that Universal Studios Florida had when it first opened. However, it appears that this parking lot will contain many more parking spaces. Some estimates put the total number of spots at over 15,000. 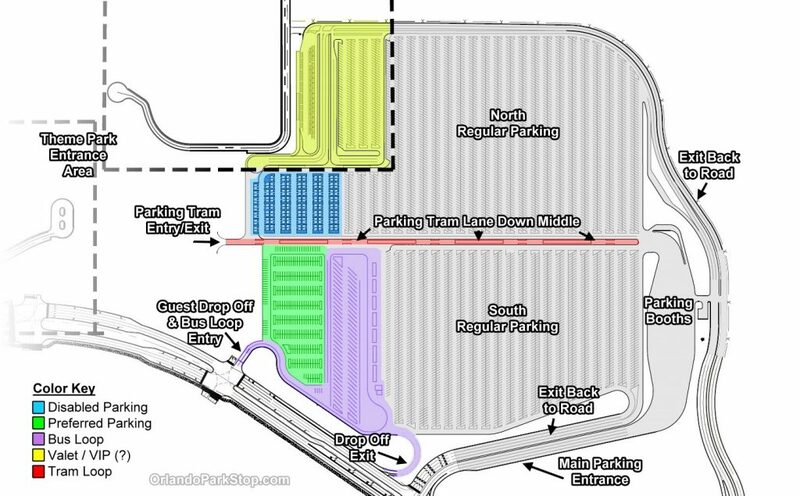 It appears as though the lot will utilize trams, as is the case with parking lots at the Walt Disney World theme parks. The original Universal Studios Florida parking lot utilized trams originally as well, before the garages were constructed when CityWalk was added to the resort. It is possible that parking garages could be constructed at a later date, depending on the needs of the new expansion area. For the initial opening however, it appears that a flat lot will be sufficient. It is my assumption that Universal will be focusing on getting construction going on the new theme park first, and then they may continue to reconfigure the area after. Let’s take a look at where I believe the new theme park will be going exactly. Tentatively named “Fantastic Worlds,” it appears that this new theme park will be built to the west of the massive flat parking lot. Land clearing was completed last year, and earth moving is happening now to shape and grade the area set aside for this new park. The park will be set against an expanded Kirkman Road to its west, a brand new road named “Universal Way” to the south, and the parking lot on its east side. North of the new theme park will be the backstage support area for the park. 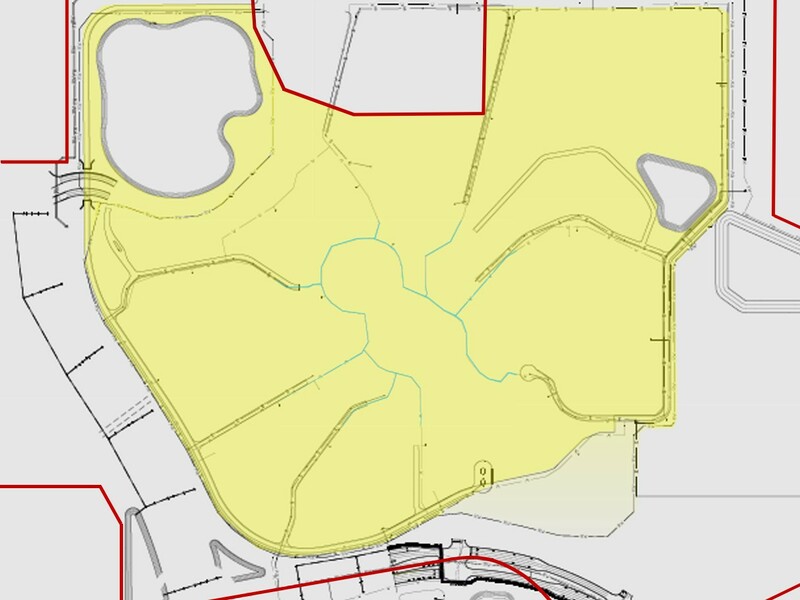 This separately permitted area will be sandwiched between Sand Lake Road to the north and the new theme park to the south. It will contain warehouses, team member parking, and all of the necessary backstage offices and structures needed to run a theme park. As I stated earlier, Fantastic Worlds will be one of the largest theme parks Universal has ever built. For illustrative purposes, I have overlaid an image of Islands of Adventure onto the development plans below. The red area is the total space available for the new park. For this illustration, some of the backstage areas for Islands of Adventure have been left out, as the backstage support area for the new park is located outside the scope of this image. This can give you a sense of the size of the area available for this new theme park. It does not appear that the new theme park will have a lagoon in the center. This will be a departure from the previous two theme parks at the Universal Orlando Resort. That means that more space can be dedicated to the themed areas of the park. 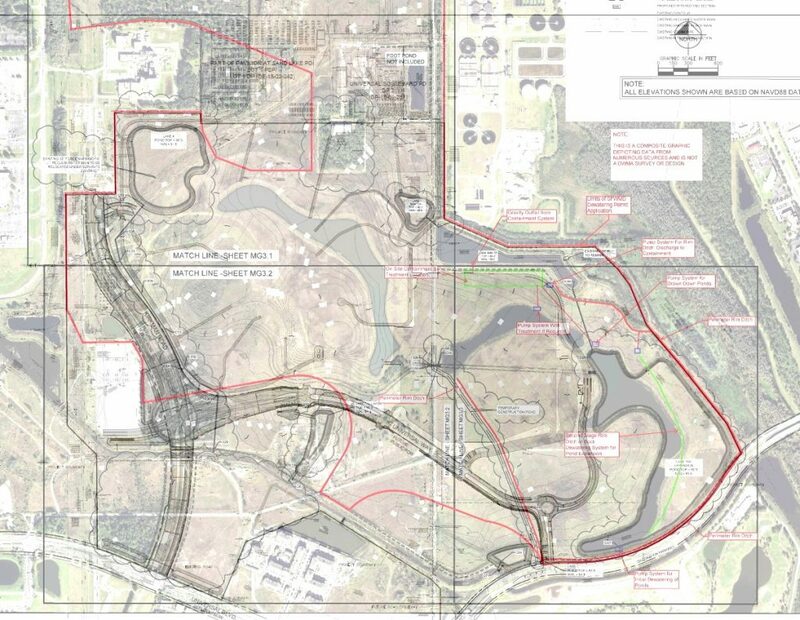 There are, however, a couple water drainage ponds that will be included within the theme park area, the largest and most notable located in the northwest corner. It should be noted that not all of the land shown in red above will be utilized for the new theme park. According to recent land grading and water runoff reports filed with Orange County, some of the area to the north of the plot falls outside the scope of the project. This may mean that the area will not be developed on, perhaps instead covered with trees or left for future expansion. 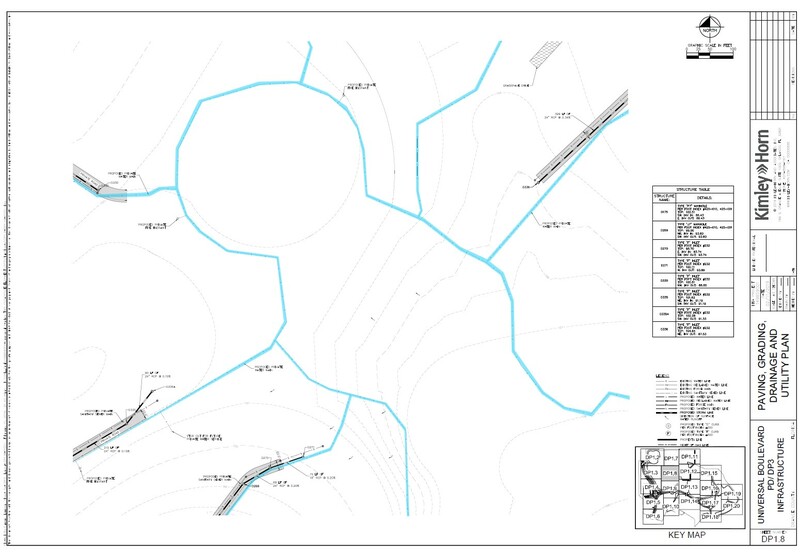 The image above shows the scope of the current work, in red outline, overlaid onto the latest development plans. 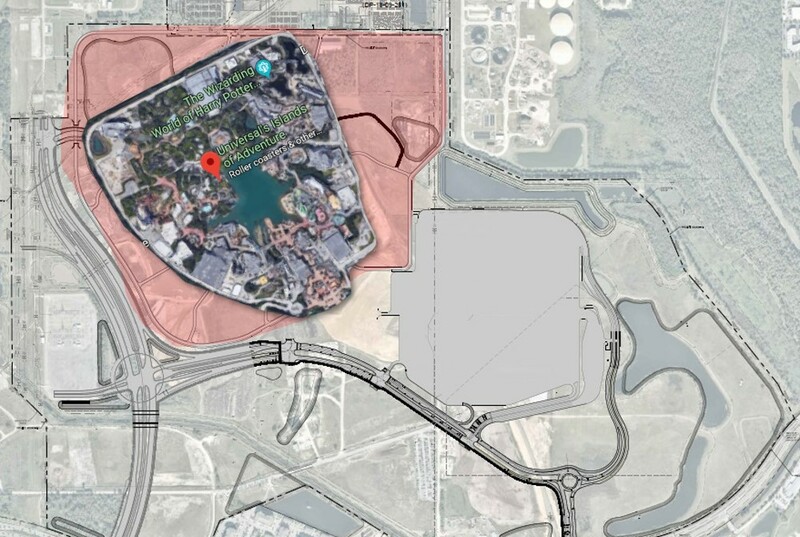 Following the red outline, in addition to how the new roads will lock in the area — as well as the parking lot to the east — the outline for the new theme park becomes even more apparent. Rumored to be created in a hub and spoke design, similar to the Magic Kingdom park, Fantastic Worlds is also rumored to contain a centralized landmark in the center of the park, located within the “hub.” The newest version of the development plans contain drainage and water main information. In the center of what I believe to be the new theme park, the water main encircles an area that could be the hub. 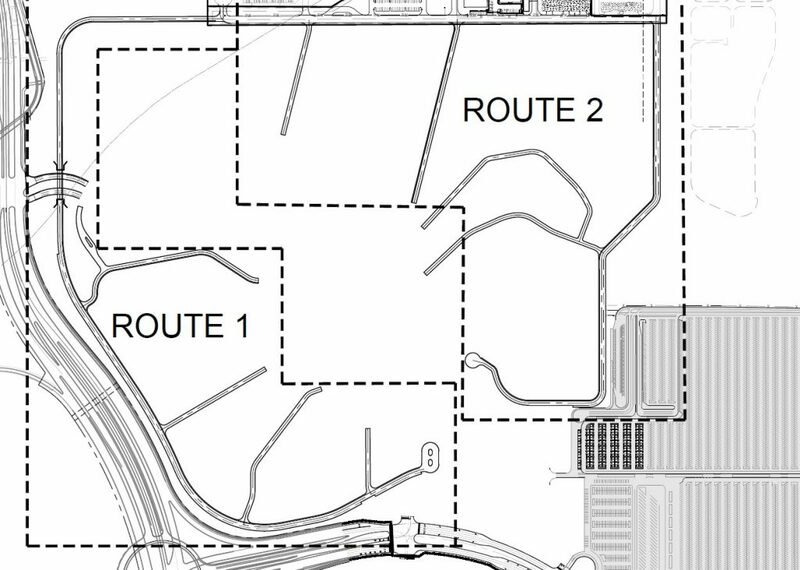 The recent development plans also show emergency routes in and out of the new theme park for fire rescue. There is a perimeter road on the west side of the new park (labeled as Route 1) and another perimeter road on the east side (Route 2). These two roads each have several smaller access roads jutting out that reach deep into the theme park. (They’re the roads that look like spider legs in the plans.) These access roads reach nearly into the middle of the park. 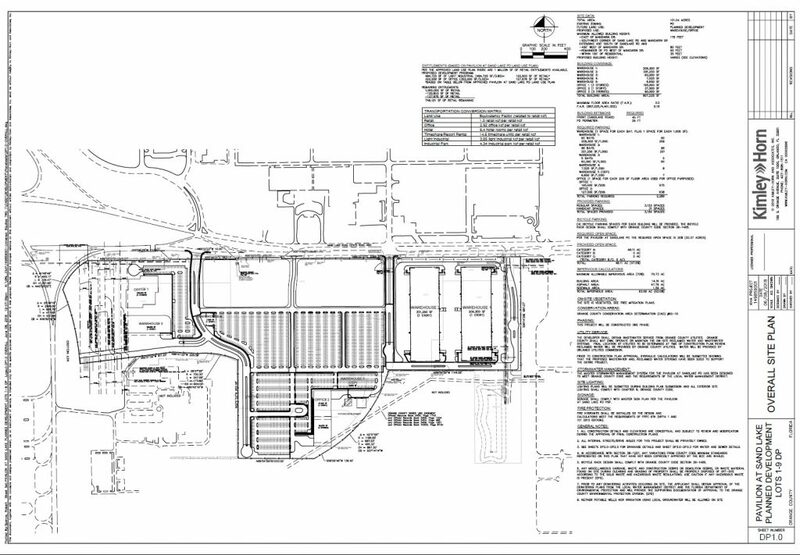 The development plans go into great detail about which size fire rescue vehicles can take which route, or enter through which backstage entry road. There will be an access road entry from Sand Lake Rd through the team member parking area and another off of Kirkman Rd, on the northwest side of the park. The individual access roads that reach in, towards the center of the park, don’t necessarily show the perfect delineation between each of the lands, (or “worlds”) of the new theme park, but it can help us start to visualize a layout for the park. 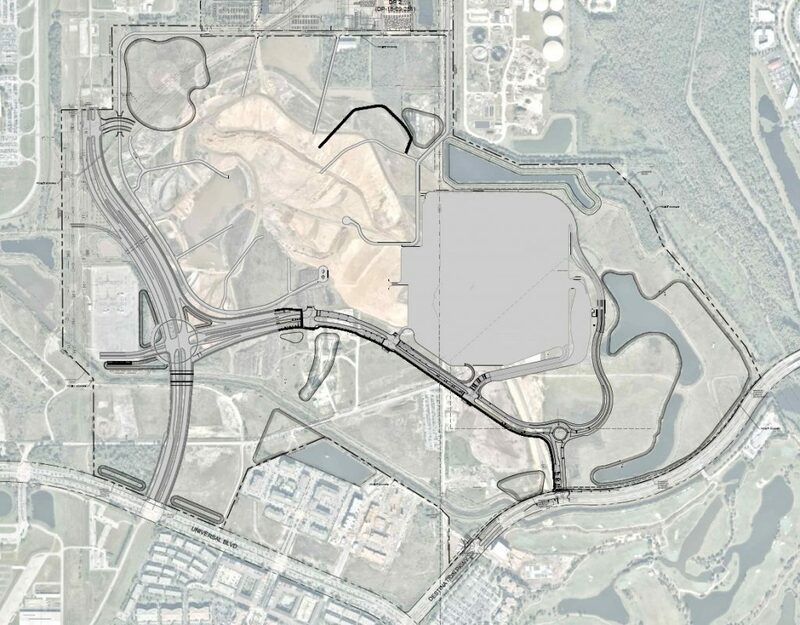 Now, when you overlay the water main pipe plan on top of the emergency access routes, along with other minor details, the new theme park’s shape really starts to become clear, (below). 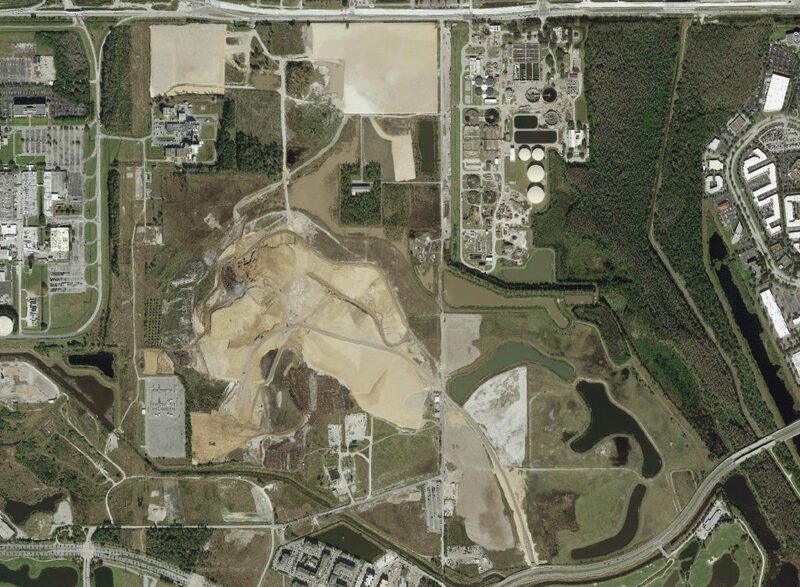 The yellow area in the image above is what I believe to be the land set aside for the new theme park. Guests would park in the flat parking lot, or be dropped off by bus, just to the right of the image. They would either travel by tram or walk to the theme park entrance, probably located between where the two perimeter backstage roads end. Walking down a sort of Main Street (the area seen between the blue water main lines in the image,) towards the central hub, guests would find themselves in the center of the park. From the central hub guests could choose which direction to go, entering a portal to one of the many lands of the new park. We’ve discussed rumors for what these different lands could be, including Super Nintendo World, DreamWorks Animation, and Universal Classic Monsters. Stay tuned for more news about the different worlds and rides for the new park in the coming months and years. Now that we know where the new theme park will be, where its parking lot will be, and what the general shape of the new park will be, we still need to know one more important detail — how will we get to the new theme park? Kirkman Road is being extended as part of a larger expansion project. The road will conveniently connect the existing resort to this new southern resort. The upgrades to Kirkman Road will also include dedicated bus lanes down the center, which will be perfect for transporting guests between resorts. The Kirkman Road expansion is on schedule to begin construction next year in 2020, and may take up to five years to complete. 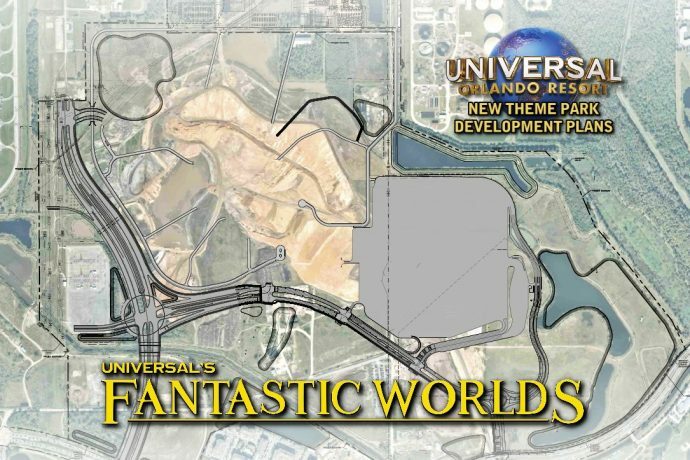 A new road will also be added on the new Universal property. Called “Universal Way” in the development plans, this new road will connect the extended Kirkman Road to the existing Destination Parkway. In between those two roads will be turn-offs that lead directly to the parking lot for the new park, as well as the guest drop off areas. There are intersections in the plans that lead to nothing as well, most likely future development that may include on-site hotels. So, the only question left is when. When will a new theme park be ready to open to the public? While there are numerous rumors out there, some that put the new park opening in only a couple years, we may still be a little ways out. The current plans call for up to two years of earth-moving. And while that did begin last year, we may still have another year or so of land-grading before vertical construction can even begin. If everything goes smoothly this year, they could start actual construction by next year. With a three-year build, similar to Islands of Adventure — the last new major theme park to be built in Orlando — that would put the opening date for this new theme park at 2023 at the earliest. Other factors to consider, such as continuing environmental cleanup and how long the Kirkman Road expansion could take, may push the opening of the new park up to 2025 at the latest. What do you think of the public development plans? And when do you think the new theme park could be opening? Leave your thoughts below and stay tuned for more news about this massive project as it happens. At this point you gotta believe THEY know pretty much everything that’s going into the park. We just don’t yet know. And I’m not so sure Fantastic Beasts will be one of the worlds, (but that doesn’t mean there wouldn’t be any more Potter). Do you think the bus lane down the middle of the road will suffice moving existing park guests to the other parks and hotels? Do you think there is a plan for something more substantial like a monorail or skyliner type of transport? With all the added hotels I also wonder if universal will ever do something like magical Express or a train from the airport. I don’t see them doing anything like a monorail or skyliner, at least not for a very long time. Maybe after they start opening more things that are even more spread out. But things like that must be developed with Orange County as it wouldn’t be only on their land. And buses will have Kirkman and Universal Blvd to transport guests, so two different routes if one is too congested. And Universal already has an airport shuttle service called SuperStar, but it is not free.